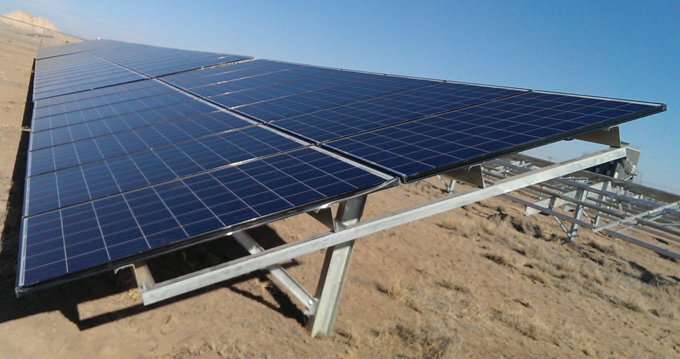 Through a team effort, S&C Electric Company, Green States Energy, and Green Earth Development constructed a 2.5 MW solar project near the famous Area 51 in New Mexico in just three months. If anyone suddenly notices shiny silver things near Area 51 in New Mexico, it's not alien spacecraft. This time it's the 2.5-megawatt GSE NM-2 solar facility, which appeared almost overnight thanks to the teamwork of S&C Electric Company, Green States Energy, and Green Earth Development. This past April, S&C Electric received a $7.9 million contract from Green States to construct the solar facility. However, to qualify for the local utility's renewable energy incentive program, the project had to be energized in a very short time—by July 11, 2013. Daniel Girard, director of Renewable Energy and Energy Storage Business Development at S&C Electric, says Green States and Green Earth Development had already been working with utility Xcel Energy in Roswell when S&C came on board. "We came in to basically manage the project and to vet all the products that were going to be used." The top team was able to tackle the project in such a short time frame in part because S&C had an ongoing relationship with Green Earth and Green States and knew they would be able to work well together. The three groups met a number of times to go through which products they wanted to use, and why and how they wanted to build the site out. Next, they met with Xcel Energy and went through the available sites. Girard says planning ahead and good choices were key to a well executed construction. "We used good suppliers, and we had the project well laid-out before it ever began," says Girard. "A lot of the upfront work was already in progress before we actually started working on the job, but between the three groups, we worked hard together. Before we moved forward, we knew where we were going to get the steel racking, inverters, and solar panels from. It allowed us to move really quickly." One of the biggest challenges, he says, was getting all the projects "to marry up with each other" to meet the Xcel requirements and install it all in one location. "Because it had to be an existing meter customer, getting the right customer to work with us—which ended up being the City of Roswell–worked for everyone," says Girard. "They were a great customer to work with, and the project helped all the citizens of Roswell by lowering their rates." Roswell was excited about the solar facility from the start and played a big role in the site placement. 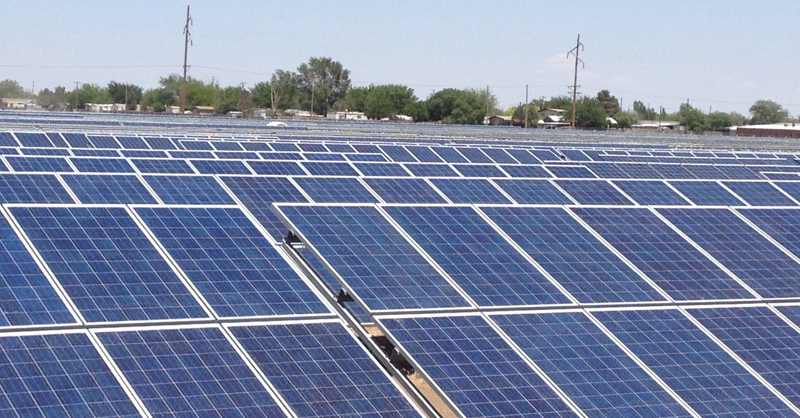 Six months before the solar facility got underway, S&C was looking at 25 different sites for the solar installation. ReneSola was contracted to provide 7,200 of its 250-watt high-efficiency polycrystalline solar PV modules for the project. Also selected was Solectria's PVI 95KW line of central inverters. "It would have been a nightmare for everybody when it came to construction and to tying everything in for Xcel, and we were looking at existing meters that the city had," says Girard. "The City of Roswell is the one who approached us and said, 'We've got this property. Why don't we just do it here?' It made a lot of sense versus going to 25 different meters, upgrading all 25 different meters, and changing them all out." The team went ahead with Ros-well's suggestion, and the rest is history. S&C, which has over 100 years of experience with utilities, drew on its strong supplier network and previous work in renewable energy. Some of the manufacturers they chose for the Roswell facility included Tennessee-based, Shoals Technologies Group, which supplied the racking, as well as DC Balance of Systems (BOS) components, which include pre-fabricated wire harnesses and DC combiner boxes. of ReneSola's solar photovoltaic modules. ReneSola was contracted to provide 7,200 of its 250-watt high-efficiency polycrystalline solar PV modules for the project. Also selected was Solectria's PVI 95KW line of central inverters. 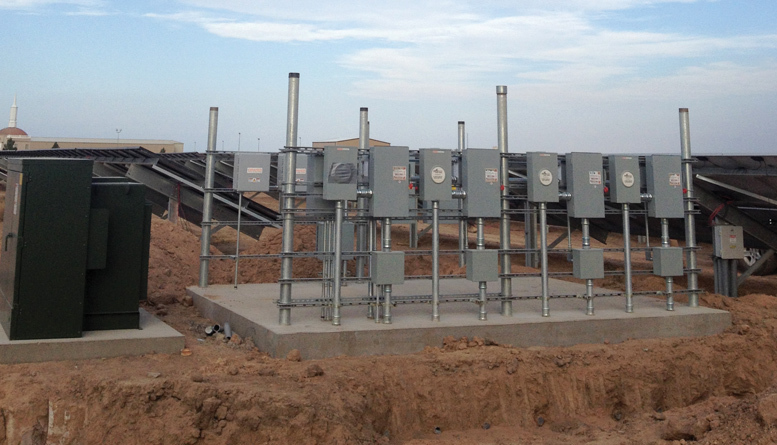 S&C developed a creative solution that divided the system into 100-kW sections tied to the owner's meters. This allowed Green States Energy to better utilize the strong solar potential around Roswell and participate in the local utility's solar incentive program. The project could not have been completed on time and on budget without incredible teamwork, which is sometimes uncommon in a project with such incredible demands. "Sometimes you start off being best friends, and by the end, you never want to work together again. With this project it went very well, and we're currently looking at other projects that the three groups can work on together," says Girard. 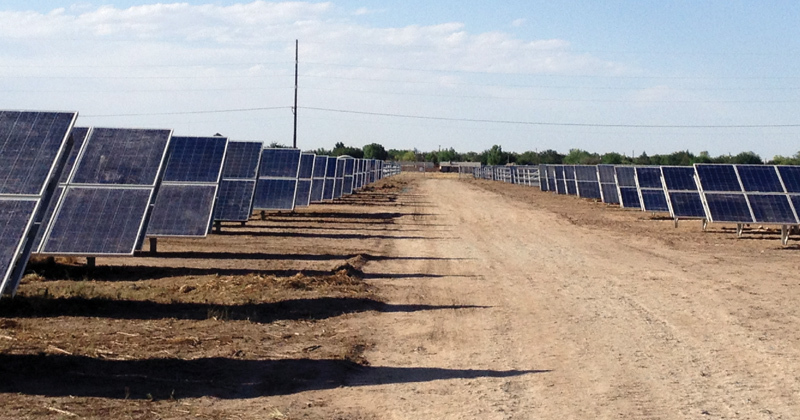 In April, S&C Electric received a $7.9 million contract from Green States Energy to construct the solar facility. However, to qualify for the local utility's renewable energy incentive program, the project had to be energized in a very short time—by July. Girard says it's so important that companies not only be quality organizations, but also on good terms to achieve a successful project. His advice to cities considering solar projects is to pick a company that you know is going to stand behind the total project. "A lot of cities put a project out to multiple companies and end up in a bidding process. And when you bid something, you can end up with something that you really didn't want in the first place," he said. "By working together as a whole team and leaving the developer, Green State, to take the lead, it really worked out well because Green State were the people who backed it, and they're the people who put it all together. But at the same time, they brought in companies such as S&C, with our strong construction background and strong equipment background, and we were able to vet all the equipment and work everything over for them." He adds, "choosing the right developer is key because it alleviates writing an RFQ, evaluating everything, and many times you're really comparing apples to oranges. Here it was very simple to choose the developer then just direct them toward the piece of property that you think would work. I believe it was actually the combination of the three companies, their backgrounds, and cooperation that helped to bring this together." S&C would know about what it takes to work with cities and utilities. Besides a century of experience, they currently have seven projects under development and eight to 10 being worked on for future development. When it came time to start construction, it went smoothly, in part due to the extensive pre-planning. Steve Maloney, the project manager on the ground, says that after the permitting, the construction end was fairly simple. "Once we received the permits and moved ahead, we expedited the schedule and actually completed the project on June 20." It also helped, Maloney says, that Roswell (essentially in the middle of the dessert) was an easy place to install. During construction, Green States hired a couple of local contractors to assist them, and S&C also hired some local contractors to assist with the installation as well. "We always try and hire some of the local people. Wherever we're building, we have a goal of 10 to 15 percent—at least —being local, and we actually shoot for 20 to 25 percent where possible," says Girard. At its peak, Maloney says there were probably about 25 people on site. Because of the three-month time frame, he says, "We had expedited schedules, working six, sometimes seven days a week." Girard says, "A large part of getting the project done on time was due to our specialty in these types of connections with utilities. It's why we were chosen to work with these folks—our utility background and our ability to work with utilities to get things in on time. "We specialize in medium voltage power systems, so when it comes to interconnecting those to the utility, we've got A: an expertise in that type of work; and B: the past experience working with that utility. We also have local people with that utility so we can speak the same language with the utility when we're generating this type of solar power, running it on a medium voltage system onto the grid." In addition to the other solar and wind projects they are currently working on, S&C is looking forward to getting deeper into the energy storage side of renewables. Years ago, S&C did the first energy storage project tied to wind. Since then, the company has integrated more than 150 megawatt hours of energy storage. "Most of those applications are large scale—utility energy storage—one megawatt and up," says Girard. "In fact, S&C has done more energy storage megawatt hour-wise than anyone else in North America." In fact, the Energy Storage Association, an industry organization focused on energy storage, just awarded S&C their first award for innovation in the energy storage field. Girard says the storage aspect allows renewables to blend in well with standard, traditional synchronous generators. "We see that as the future of renewables." In the meantime, the City of Roswell will be experiencing the benefits from the new solar facility — happily trading alien spaceships for clean, renewable energy.